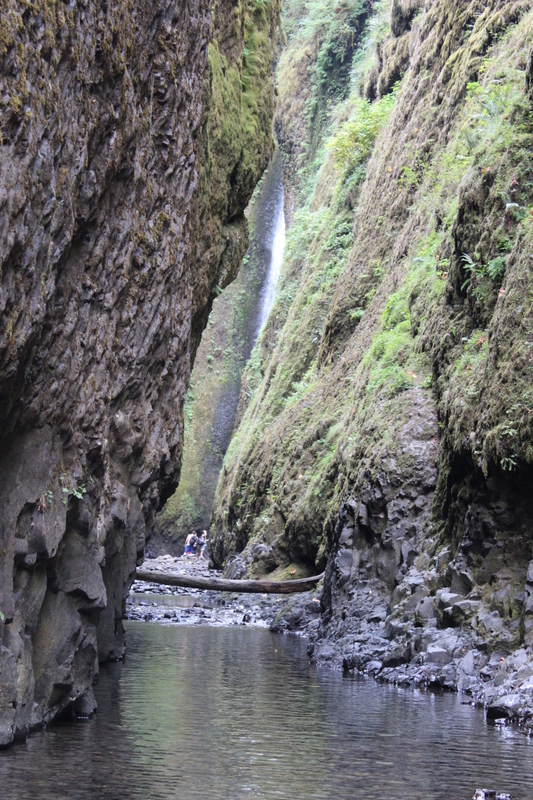 One of the most beautiful spots in the Columbia River Gorge. But you have to earn it, to get inside. 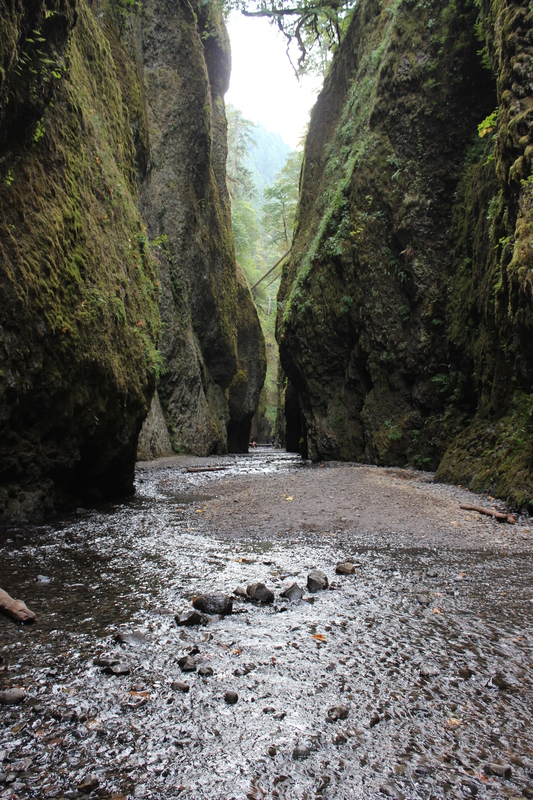 Oneonta Gorge is a magical canyon hidden just off the the Old Columbia River Highway. Sheer moss and fern-covered rock walls border the creek that runs from a huge waterfall at the far end. It’s a beautiful spot, only about a quarter mile from the parking lot, but getting there isn’t easy. 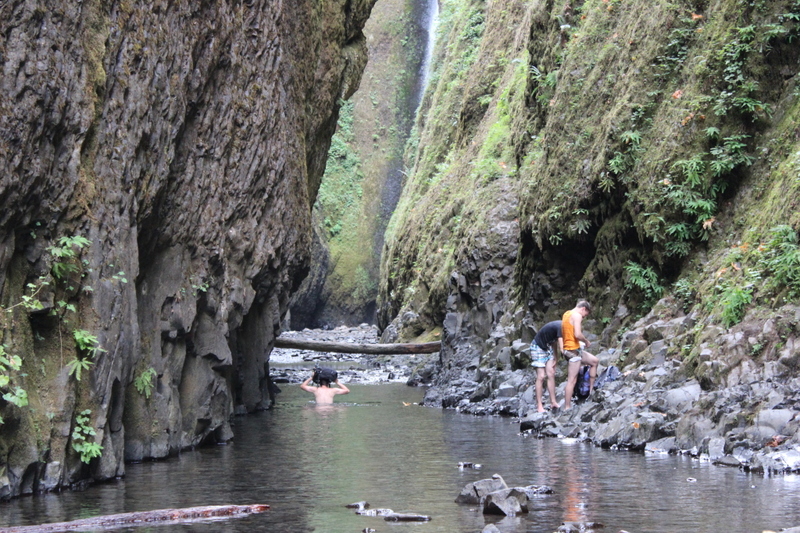 I suppose that’s good otherwise this place might be as popular as Multnomah falls. 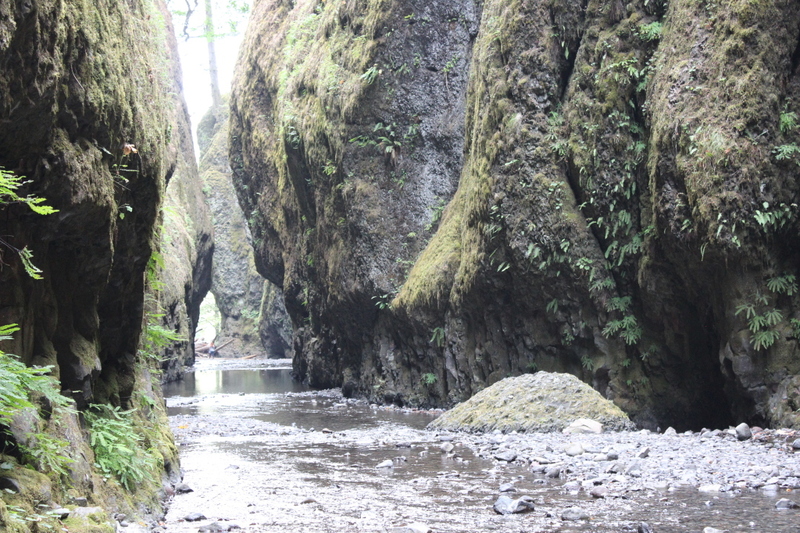 From the road, Oneonta Gorge doesn’t look like much, but once you follow the stairs down into the creek bed you’re not far from the beginning of the adventure. 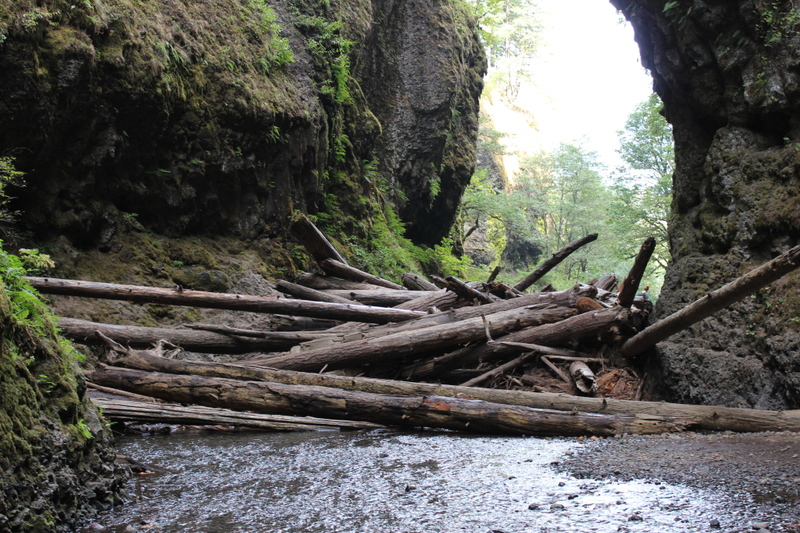 What separates the gorge from the rest of the world is giant log jam right at the mouth. Lots of people have climbed this over the years, so it’s well packed down and worn in. 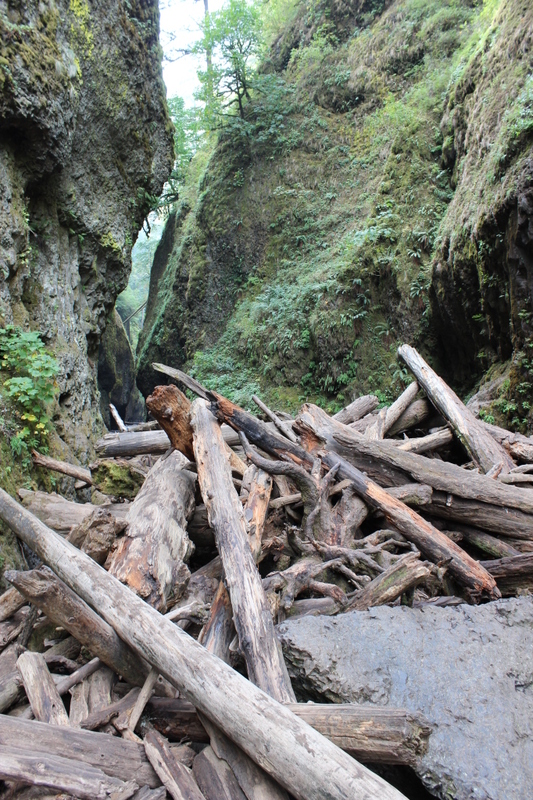 Not too hard to see the routes to get through, but there are still some scary spots. If you aren’t careful you could seriously hurt yourself. so take this seriously if you try it. A rainy day might not be a good idea. Dogs and small kids, also probably a no-no. My friend, Liz, and I took our time and made it through the jam in about 10-15 minutes with no problems. One on the other side, you’re in the canyon, but the adventure isn’t over, because now you are in a creek! At this time of year the water is running low but it is still VERY cold. We waded through the water up to our knees, which was really painful. I don’t deal with cold water very well, and that was a problem because up ahead the water got deep. A group of guys in front of us were up to their chests! And that is the only way through! We stood watching the three of them carry backpacks over their heads as they walked the 20-30 feet through the deep water. It was possible, but were we willing? After much hand wringing I said…. no. We were so close, the waterfall is within sight… but the water was just deeper than I was prepared for. If it had been waist deep I would have gone in, but chest-deep or even higher was too much for me. We decided to turn back, but it was still a success. 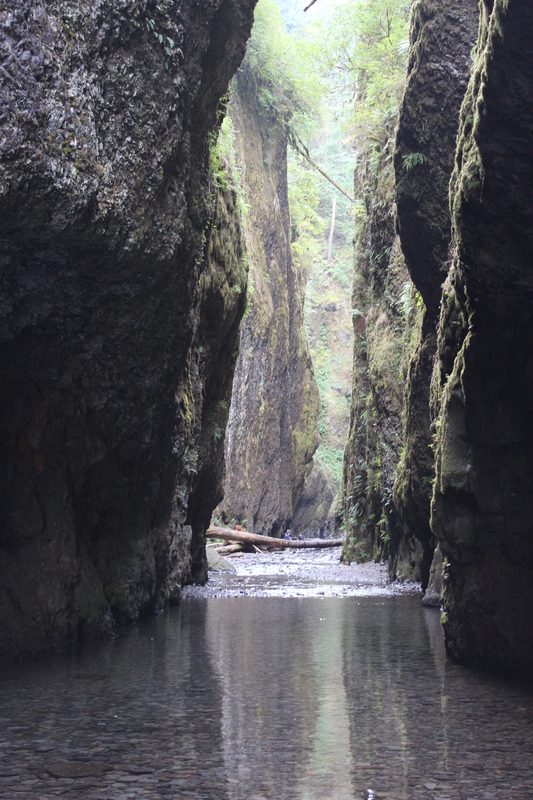 The gorge is pretty spectacular no matter how far you make it in. It was a fun adventure and yes, I would try it again, maybe with something to float me across the water? 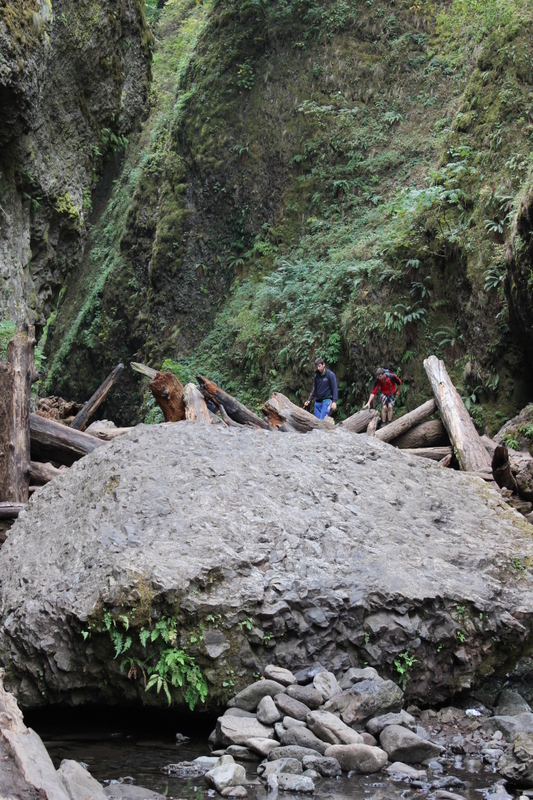 Getting back down through the log jam was actually a little more challenging than on the way in, but we both made it with nothing worse than dirty pants. All together the trip was less than a mile and something to be proud of. If this summer weather holds out, go check it out, or put it on your list for next summer. Here are the directions to the “trailhead”.